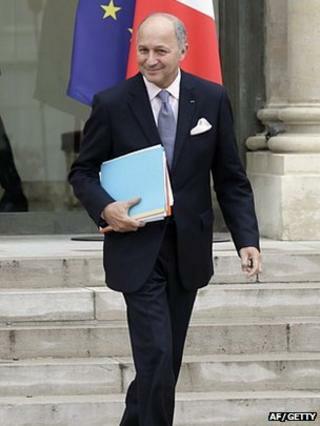 Image caption Laurent Fabius rejects the idea that the UK can "do Europe a la carte"
The French foreign minister says France will welcome any businesses that leave the UK, should the country exit the European Union. Reacting to David Cameron's speech on Europe, Laurent Fabius said: "If the UK decides to leave the EU, we will roll out the red carpet to businessmen." But business groups in the UK were more supportive of Mr Cameron's speech. The prime minister has pledged to hold fresh negotiations and an "in/out" referendum on UK membership of the EU. "You can't do Europe a la carte," Mr Fabius said, responding to the pledges. "I'll take an example which our British friends will understand. Let's imagine Europe is a football club and you join, but once you're in it you can't say let's play rugby." Mr Fabius's remark about the red carpet was in response to an invitation made by the UK Prime Minister last year. David Cameron said then that he would roll out a red carpet for any entrepreneurs wanting to leave France because of increased wealth taxes. But the UK's biggest business organisation, the CBI, expressed support. "The prime minister rightly recognised the benefits of retaining membership of what must be a reformed European Union," said the director general, John Cridland. "The single market is fundamental to the UK's success, but closer union of the eurozone is not for us." Well-known venture capitalist, Jon Moulton, founder of Better Capital, also welcomed David Cameron's speech. "It was definitely in the direction we'd favour," he told the BBC. "It's about getting the EU to be less bureaucratic, and to stop them shoving some legislation down our throats." But Mr Moulton said he was concerned about the uncertain environment for business over the next five years. "The timescale will be protracted, and the only certainty is that we'll now have five years of uncertainty. It's pretty adverse for people investing in the UK that there's not going to be a decision for five years." "I think that's nonsense," said Lord Wolfson, the boss of the retail chain Next, and a Conservative peer. "The only thing that's damaging to British business is the march of regulation, which weighs industry down." There was also reaction from business and political leaders at the World Economic Forum, currently taking place in Davos, Switzerland. David Sproul, the UK boss of accountancy firm Deloitte was also critical, citing the years of uncertainty that now lie ahead for foreign investors in the UK. "The Europe debate does not help to create certainty," he said. "When I talk to US clients who have not been immersed in the European debate as we have, they say that what they need is clarity. There is no question it will impact business - it will hit investment into the UK," he told BBC News at the gathering held annually at the Swiss ski resort. Sir Andrew Cahn, the former chief executive of UK Trade and Investment, went further, calling the next five years a period of "investment chill." "If you don't know whether Britain is going to be a full positive member of the European Union in five years time, you'll wonder if you want to make that additional investment," he said. During his speech, David Cameron repeatedly insisted that the European single market would be at the heart of any new treaty with Brussels. "Continued access to the single market is vital for British businesses and British jobs," he said. Since it began 20 years ago this month, the single market has established free movement of people, money, goods and services throughout the EU, a market that now includes 500 million consumers in 27 countries. Most business leaders agree with the Prime Minister that the UK needs to retain its place in that market, especially if it wants to continue to punch above its weight when attracting foreign investment. "The vast majority of businesses across the UK want to stay in the single market," said John Longworth of the British Chambers of Commerce. "But on the basis of a revised relationship with Europe that promotes trade and competitiveness," he said. In theory, the single market means that inefficient companies will struggle, but efficient companies expand. The EU says the result has been a rise in quality, and a reduction in prices. It claims that the cost of a mobile phone call has fallen by 70% since the single market came into operation, and the cost of a plane ticket has fallen by 40%. Some will argue that such cost reductions are not down to the single market alone. Nevertheless, the EU says it is a "recipe for prosperity." One of the issues the government will examine is the issue of working hours. An EU directive, incorporated into UK law, limits the amount of time that most people work to 48 hours a week. Should the government decide to repatriate that power, businesses might have greater freedom to ask their staff to work longer, a move that would be highly controversial. "The working hours of British doctors should not be set in Brussels," said Mr Cameron. Jon Moulton, of Better Capital, said he agreed. But Paul Walsh, the head of the drinks giant Diageo, suggested that businesses in the whole of the EU could benefit from an end to such regulations. "The reformed EU must be more competitive, with highly flexible labour markets and fewer, less intrusive institutions," he said from the World Economic Forum in Davos. "It is important for industry to help articulate the case that the prime minister has outlined."